Naruto's a hit on Cartoon Network and in the pages of Shonen Jump, so it's easy to see why Naruto costumes are just as popular. 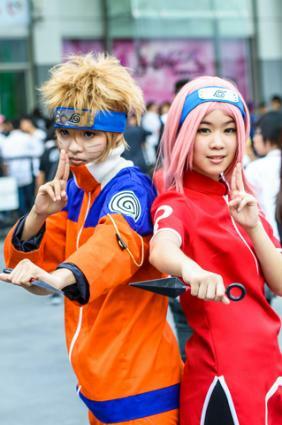 Why Wear a Naruto Costume? Naruto is a popular anime and manga (Japanese animation and comics) series focusing on the exploits of a group of ninjas in training as they seek to become the most powerful in their village. In addition to dressing up for Halloween parties, anime fans will sometimes dress as their favorite characters while attending conventions, a practice known as cosplay. Dedicated cosplayers will sew detailed outfits and accessories, dedicating countless hours to each costume. Whether you're creating Naruto costumes from scratch or assembling one from pieces you already have around the house, you can become your favorite Naruto character by paying attention to the details. Naruto wears a zip-up jacket and pants similar to a tracksuit. The jacket and pants are orange, but the jacket has blue areas on the shoulders, a blue band at the bottom, and white ribbing around the collar that almost looks furry in some pictures. His hair is short, yellow, and spiky. Naruto wears a blue headband. Black whiskers are drawn across his cheeks, with three whiskers on each side. He wears blue shoes with the top area over the toes cut away. Sasuke has medium-length black hair. He wears white knee-length shorts and a blue short-sleeve shirt. The shirt has a large collar, much like an exaggerated turtleneck. He wears a blue headband. Sasuke wears white wristbands and legwarmers with narrow blue bands on each end. Blue shoes with exposed toes complete his look. Sakura wears a red sleeveless dress/long shirt with slits up the side, and tight green shorts underneath, like biker shorts. Her headband is also green. She has pink hair that is long or short, depending on the time in the series. Her shoes are green with exposed toes. Kakashi wears dark blue pants, a dark blue long-sleeved shirt, and dark blue fingerless gloves with metal bands on the back. He wears a green jacket-vest over it all, similar to a utility vest. A mask extends from his clothing and covers his face to just past the nose. Kakashi wears a dark blue headband. One of his fighting techniques in the series involves a special ability in his left eye. Sometimes he wears his headband tilted to cover the eye. When the eye is exposed, there is a noticeable scar stretching from his eyebrow to the edge of his mask. He has short gray hair in the back with long bangs sweeping forward above his head. There are countless other characters appearing throughout the show's long run, so if a character catches your eye, study his or her look and see if you can mimic it. Wikipedia offers a complete list of characters if you need ideas for Naruto costumes. All characters in Naruto wear headbands to show their ninja nature. The headband is a wide strip of cloth with a metal rectangle in the center. The metal is imprinted with a logo representing the wearer's home village. For instance, the main characters from Leaf Village share the same leaf-swirl imprint. Male characters wear it tied directly across the forehead, while females may wrap it around the top of the head, using it more like a traditional headband to hold their hair back. It's easy to make your own headband from a strip of fabric. Cut it to the appropriate width and tie it behind your head, or sew it into a band if you're using a stretchier material that you can slip over your head. For the "metal" square, you can paint it directly onto the band with silver fabric paint, or glue on a separate piece of material on top for a more raised look. Aluminum foil will give you the right metallic sheen, or you could paint a piece of paper or cardboard silver. If you're feeling ambitious, you could even use an actual scrap of metal to make the village identifier, painting on the logo or etching it directly into the base if you have the appropriate tools. 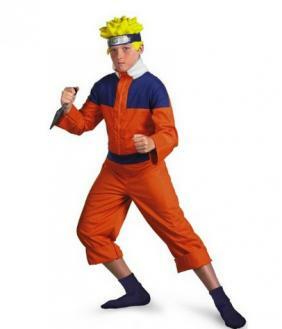 If you don't want to make your own headband, they are the most widely available accessories for Naruto costumes.